One of my favorite festivals is the Burnet Bluebonnet Festival, precisely because it does such a good job of showcasing Burnet’s small town charms, sharing the beauty of springtime wildflowers that paint the roadways and hillsides, and including our animal companions in the fun. 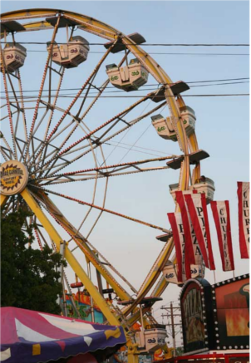 Most of the festivities are located at or near the town square at Washington St. and Main St. Expect to park a short distance away and walk to the activities. 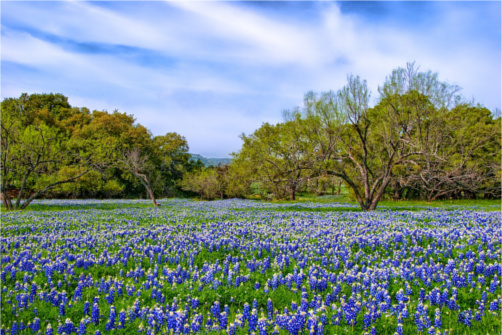 Before or after your time in Burnet proper, make sure to drive along the two-lane roads to take in the spectacular beauty of the spring wildflowers. Here are my personal favorite parts of the Burnet Bluebonnet Festival, coming up April 12-14, 2013. 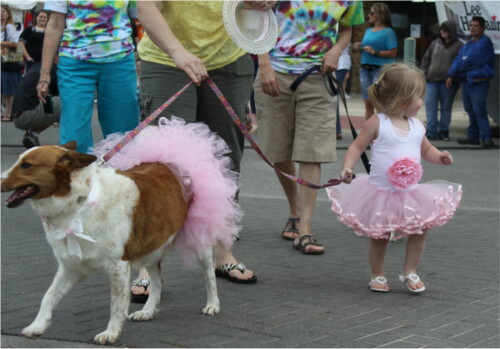 Friday evening, the first day of the festival, ushers in the Burnet Bluebonnet Festival’s pet friendly events. Well mannered pets of all types are welcome to participate in the pet parade. Since dogs and cats are the most popular pets, you will see a lot of them. But other furry, feathered and even scaly animal friends accompany their people during this family friendly parade. Farm animals like goats and pigs show up, along with itty bitty house pets like hamsters, and occasionally a snake or two. It’s like animal utopia, all coexisting together…at least for the duration of the parade. Dressing up isn’t required, but some animals (and people!) sport crazy costumes (some of my past favorites were Dorothy and Toto and human/canine ballerinas). This event takes place in Burnet’s historic square at 6 PM on April 12th, beginning at the Herman Brown Free Library. Long bodies, short legs and floppy ears moving at a feverish pace to win their doggie heat…I couldn’t help but smile and laugh as I watched these little dogs go wild at their very own race event! 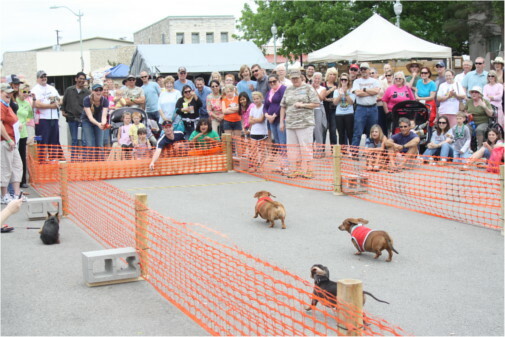 Let’s be honest, weiner dogs aren’t known for their speed, but watching them have a ball racing against other long-bodied, short-legged canine friends is definitely an entertaining, joyful sight. It is nearly as much fun to watch their excitable humans coaxing and calling to their canine Jackie Joyner Kersey’s and Carl Lewis’ to cross the finish line first. I thought the novelty would wear off after watching a race or two, but it didn’t. It’s an event I look forward to seeing whenever I go to the festival. Races begin at 2 PM on Sunday the 14th, at the historic downtown square. 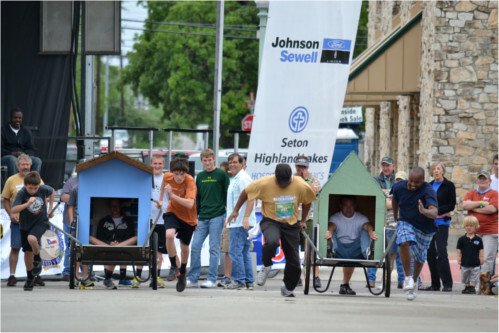 Another unique and family-fun event at the Burnet Bluebonnet Festival is the annual Dog House Race. Fido gets temporarily evicted from his abode as four-person teams super charge Rover’s house and convert it into a racing machine on wheels! The actual race is only part of the fun. Teams also compete to win prizes for creatively decorating their dog house. Each team has a rider that takes up residence inside a colorfully painted doggy dwelling, and then gets pushed and pulled to the finish line by the other three team members. It’s a silly race, but that really is the charm as you watch kids with their moms and dads having fun and being goofy together, or see grown men grunt and sweat to win bragging rights for winning a race that involves loading up a dog house onto a cart and pushing it around the town square. This race has the spirit of the 1950’s yesteryear, bringing people “into the moment” and enjoying wholesome, unplugged fun. The simplicity and silliness is the heart and soul of the event. The fierce competition begins at 12:30 on Sunday the 14th, in front of the main stage at the town square. A food court located just East of the town square ensures that visitors have access to all the festival staples. For sit down service, Tea-Licious, located on the square, is known for tea, quiche, delicious homemade sweet pickle and showcasing beautiful homemade quilts. Thai! is a yummy, authentic little restaurant located in, of all places, the Shell gas station on Polk Street as you leave town. As much fun as Austin is year round, Austinites may occasionally feel the need to adventure outside the city. Burnet is so accessible from Austin, a short and scenic drive that humans and canines will both enjoy. 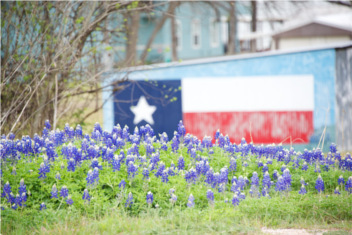 The Burnet Bluebonnet Festival is the perfect excuse to take a weekend trip to the Highland Lakes to explore this endearing town’s historic square and check out the great hiking/biking trails and wildflower festooned country roads. Visit the Festival’s website for a full list of events, including an air show, Grand Parade, carnival, arts and crafts fair, live music and more. Tracey has lived and worked in both Austin and Burnet. While not a native Texan, she has genuine love of the Texas Hill Country, especially in the spring, and loves to write about the little gems she’s discovered while living here. Slider photo courtesy of Alana Welsch Black.